7 August 1914: Entered the Royal Bavarian Army as a War Volunteer in the Replacement Squadron of the Bavarian 3. Chevaulegers [Light Cavalry]-Regiment Herzog Karl Theodor. 20 April 1915: In the field with the 5th Squadron of the Bavarian 3. Chevaulegers-Regiment Herzog Karl Theodor. 4 June 1915-17 July 1915: Officer Aspirant Course with the Bavarian 3rd Infantry Division. 5 October 1915: Transferred to the Replacement Battalion of the Bavarian 2nd Jäger Battalion. 28 January 1916: In the field with the 4th Company of the Bavarian 2nd Jäger Battalion. 17 July 1916-9 October 1916: Wounded by grenade fragments in the right and left thighs/in hospital. 10 October 1916: Transferred to the Replacement Battalion of the Bavarian 2nd Jäger Battalion. 31 May 1917: In the field as a Platoon Leader in the 4th Company of the Bavarian 2nd Jäger Battalion. 21 November 1917-3 December 1917: Deputy Leader of the 1st Company of the Bavarian 2nd Jäger Battalion. 13 January 1918-8 February 1918: Deputy Leader of the 4th Company of the Bavarian 2nd Jäger Battalion. 11 March 1918-7 May 1918: Detached to the Field Recruit Depot of the Alpine Corps as a Training Officer. 12 May 1918: Transferred to the 2nd Company of the Bavarian 2nd Jäger Battalion. 27 May 1918-1 June 1918: Deputy Adjutant of the Bavarian 2nd Jäger Battalion. 21 September 1918-12 October 1918: Adjutant of the Bavarian 2nd Jäger Battalion. 13 October 1918: Detached as an Ordnance Officer to the staff of the Bavarian 2nd Jäger Battalion. 26 November 1918: Leader of the 3rd Company of the Bavarian 2nd Jäger Battalion upon the demobilization in Germany. 10 March 1919: Leader of the People’s Home Defense Company. 6 May 1919: Leader of the 1st People’s Defense Company. 14 June 1919: Leader of the 9th Company of Reichswehr Infantry Regiment 45. 10 September 1919: Platoon Leader in the 9th Company of Reichswehr Infantry Regiment 45. 1 October 1920: Platoon Leader in the 10th Company of the 20th (Bavarian) Infantry Regiment. 1 January 1921: Platoon Leader in the 6th Company of the 20th (Bavarian) Infantry Regiment. 1 December 1921-28 February 1922: Detached with the 6th Company to the Guard Troops of the Commandant of Berlin. 1 October 1923: Transferred to the 8th (Machinegun) Company of the 20th (Bavarian) Infantry Regiment. 18 September 1924-16 October 1924: Detached to the Machinegun Course at the Grafenwöhr Troop Training Area. 1 April 1925-15 August 1924: Detached to the Weapons School Course at Döberitz. 23 March 1925-27 March 1925: Military District training with the 3rd Division, Berlin (during this time in the 8th (Machinegun) Company with Berlin Guard Troops). 19 October 1926-16 November 1926: Detached to the Weapons School Course at Döberitz. 14 March 1928: Delegated with the post of Chief of the 6th Company of the 20th (Bavarian) Infantry Regiment. 1 April 1928: Chief of the 6th Company of the 20th (Bavarian) Infantry Regiment. 9 October 1928-24 October 1928: Participation in the Combat School Course A at Döberitz. 1 October 1929: Chief of the 8th (Machinegun) Company of the 20th (Bavarian) Infantry Regiment. 1 July 1934: Transferred to the staff of the Commandant of the Grafenwöhr Troop Training Area. 6 October 1936: Allowed to carry the Uniform of the 20th (Bavarian) Infantry Regiment. 1 May 1942: Delegated with the leadership of the 7th Mountain Division in Finland. 22 July 1942-31 August 1942: Army High Command Leader Reserve. 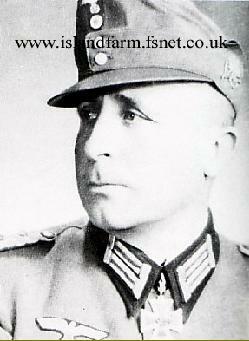 10 September 1942: Leader of the 7th Mountain Division in Finland. 8 October 1943-8 November 1943: Cure in Bad Gastein. 28 April 1944-31 May 1944: On leave. Knight’s Cross of the Iron Cross: 21 June 1941, Oberst, Commander of Gebirgsjäger-Regiment 85. Prussian Iron Cross, 1st Class (1914): 18 May 1918. Prussian Iron Cross, 2nd Class (1914): 17 June 1917. 1939 Bar to the Prussian Iron Cross, 1st Class: 25 June 1940. 1939 Bar to the Prussian Iron Cross, 2nd Class: 12 June 1940. Bavarian Military Merit Cross, 2nd Class with Swords: 25 June 1917. Austrian Military Merit Cross, 3rd Class with War Decoration: 2 May 1918. Wound Badge in Black – World War I award: 10 June 1918. Finnish Order of the Cross of Liberty, 1st Class with Swords: 15 May 1943. Saber of Honor for good shooting with the heavy machinegun: 21 November 1933. Mentioned in the Wehrmachtbericht [Armed Forces Communiqué]: 11 June 1941; 24 August 1943. 9 May 1915-23 July 1915: Combat on the Western Front. 1 February 1916-19 March 1916: Combat in the Balkans. 2 April 1916-18 July 1917: Combat on the Western Front. 6 August 1917-11 September 1917: Combat in Romania/Eastern Front. 18 September 1917-16 December 1917: Combat in Italy. 5 February 1918-1 October 1918: Combat on the Western Front. 10 October 1918-5 November 1918: Combat in the Balkans.